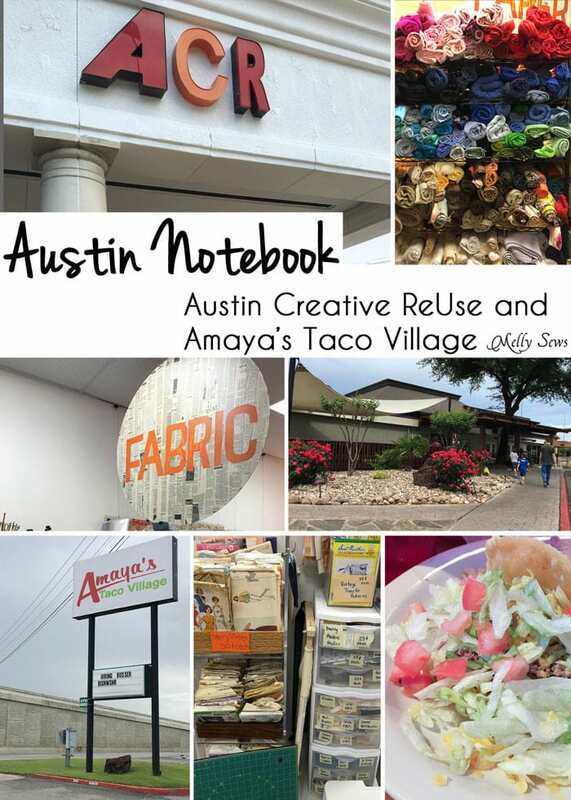 Hey y’all – today I’m sharing another installment of my Austin Notebook – and this time we visited Austin Creative ReUse and then stopped off at one of my favorites, Amaya’s Taco Village. This was a family fun Saturday. Let’s start with Austin Creative ReUse. This was my first time visiting this fairly new shop, but it will not be my last! 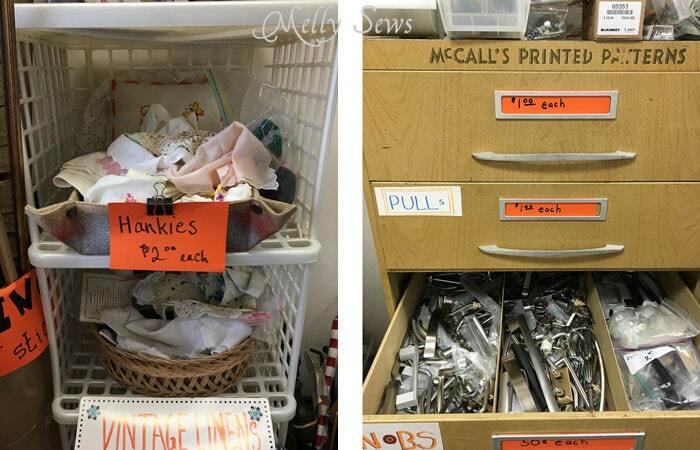 If you like garage sales, thrifting, and any kind of crafting (including sewing) like I do, this place is like the best organized thrift store of all the good crafting stuff at garage sale prices. 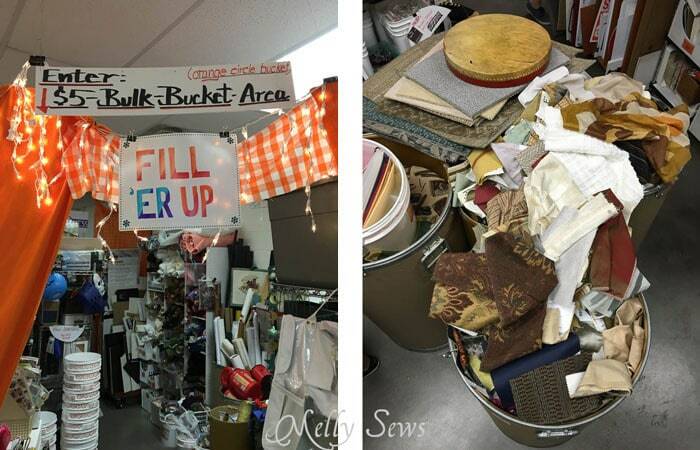 Austin Creative ReUse is a non profit with a mission to reuse things that can be used in crafting and art instead of letting them go to the landfill. It’s not a huge space, but it is PACKED with goodies. Near the door, the first thing I spotted were vintage linens. Then I got excited about a McCall’s patternd drawer fixture, but that turned out to contain all manner of hardware. 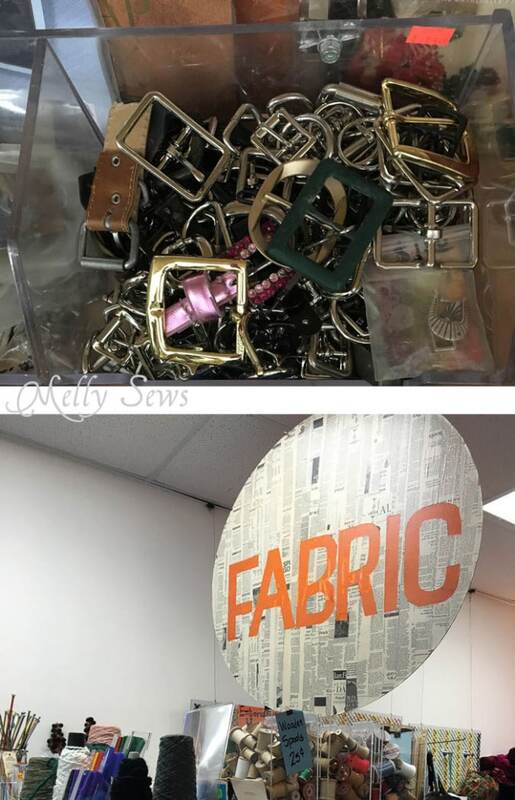 On a nearby shelf, there was an entire bin of buckles and rings – perfect purse hardware, and everything was $0.25 each! Turning around, I did see the fabric section. Each crafting area has one of those cool paper signs over it. Do you see those bins of wooden spools? I really, really tried to figure out what I could do with them because I wanted them all. There were also tons of old sewing patterns, notions and fabric! I loved the rainbow fabric display, and though I wasn’t there for any yardage (my stash is currently overflowing) I did pull out a few bundles to note that pretty much everything was $1/yard. There was even a working sewing machine for sale – you can sort of see its case above in the picture on the left, next to the cutting mat. We took the boys with us, and by this point Tater (who loves junk and creating art from it) wanted to buy everything. I talked him out of both beer caps and wine corks by pointing out that both get thrown out at our house on a regular basis. But he was still super excited, and that was before he spotted the bulk bucket area at the back of the store. In that area, you can get whatever you want for $5/bucket. I poked around a little (it was much more crowded than I expected) and saw two barrels of upholstery fabric samples and another shelf of smaller fabric yardage. 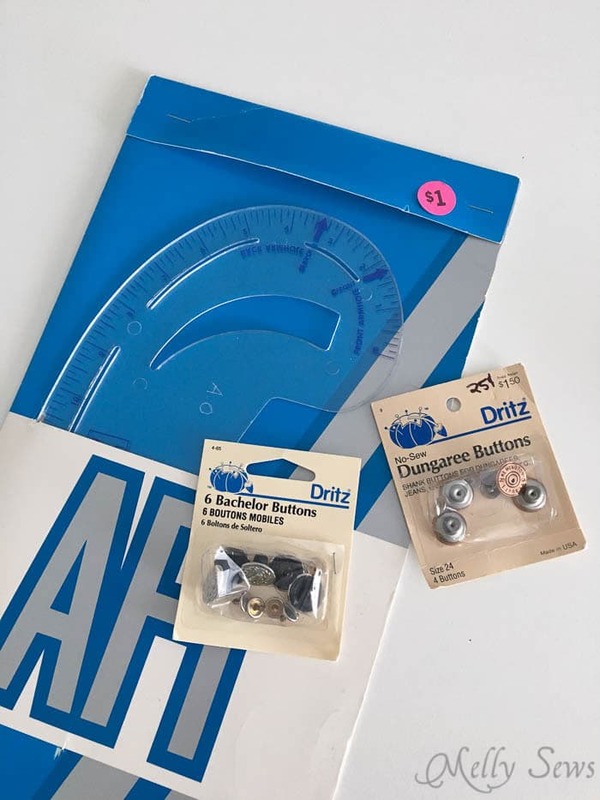 In the end, I walked out for $1.50 and took home a French curve still in it’s package and two packages of jeans buttons – which I was actually going to stop at a big box store to get on the way home. 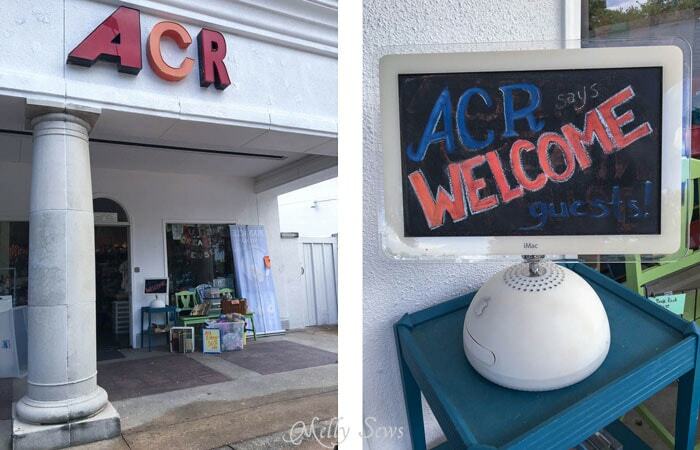 If you are in the north central Austin area (ACR is in a shopping center right off of I-35) Austin Creative ReUse is definitely worth a stop. The only thing is that they’re not open every day – currently it’s only Wednesdays, Thursdays and Saturdays. 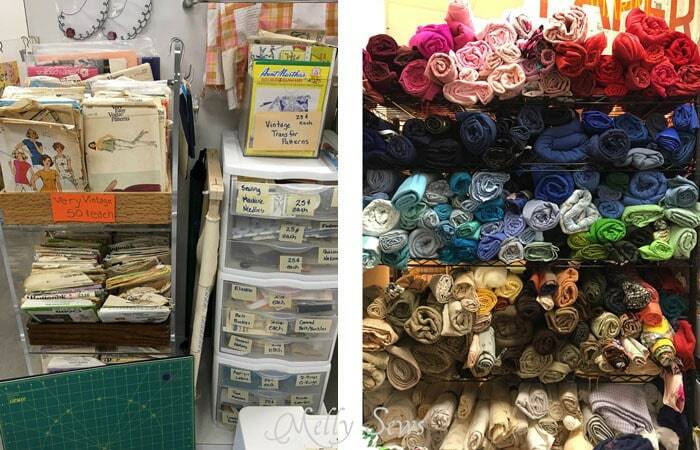 Oh, and one more thing – if you happen to live in the Austin area and need to clean out your sewing room before shopping, they accept donations of craft and sewing items! Find a full list of what they do and don’t accept here. Just a little way down the I-35 frontage road, we got lunch at one of our favorites, Amaya’s Taco Village. This restaurant used to be a tiny hole in the wall across the freeway, but several years ago they moved into this much bigger space. And it is still packed all the time. But not with the hip and trendy crowd, as this isn’t a hip or trendy place. No, this is Mexican comfort food, the kind my grandmas made when I was a little kid. There’s not much ambiance inside – expect serviceable table, drop in ceiling, cement floors. But no one comes to Amaya’s for the ambiance. Also, they are always busy, and that means that often the service is slow. Luckily there’s lots of chips and salsa to eat while you wait for your food. 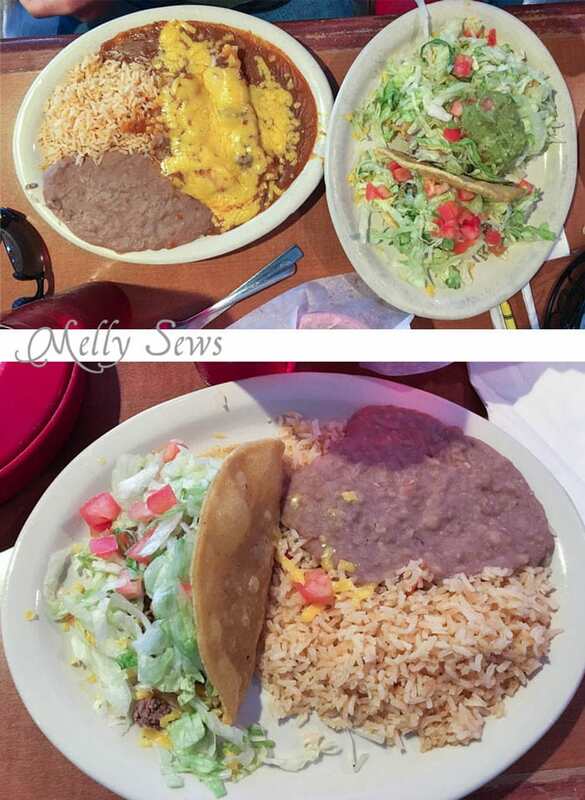 The salsa is just the right amount of spicy hot, and the plates are overflowing. If you’re like the Coach, you get the special that has one of everything (below). Under all that red sauce and cheese is both an enchilada and a tamale, and the lettuce is hiding both a chalupa and a taco. But I’m a purist. You go to Amaya’s for the tacos. 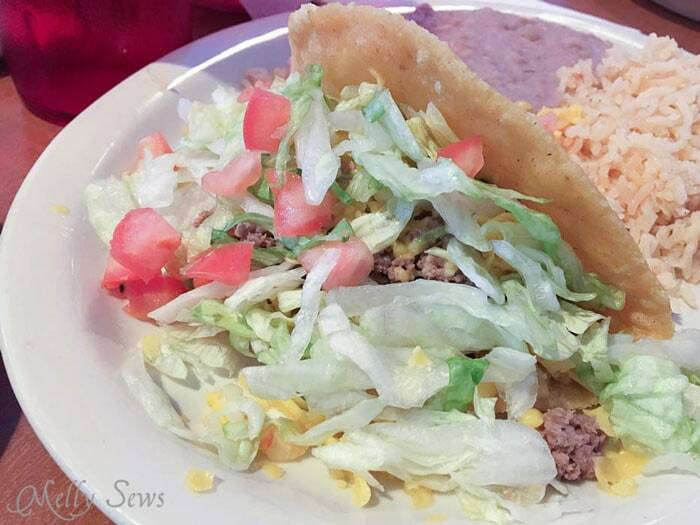 The shells are the perfect texture – soft enough that they don’t break when you bite into them, but firm enough to hold their taco shape. The toppings are basic (lettuce, tomato, cheese) but also a perfect compliment to the not too dry not too juicy ground beef. Mmmm, I’m getting hungry writing this. So next time you find yourself in what is not the nicest of trendiest part of town, check out a couple of my new and old local favorites. Thanks for sharing about Austin Creative Reuse, I will have to go check it out one Saturday if I can ever drag myself out of the house on a weekend! I savor my Saturdays for staying home and getting caught up on things since I have to work during the week. And while I’m at it, I will have to go eat at Amaya’s. It has been so long since I have eaten there. I used to eat there at least once or twice at week when I worked down around the 183 area. They have great food!